Suffer the little children to come unto me, and forbid them not; for such is the kingdom of God. 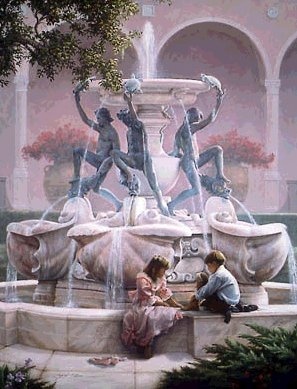 Original art Courtesy of Greg Olsen - You can visit his website here. Many thanks to Mr. Olsen for giving us permission to use his art on our site. This song, 'I Am A Child Of God was taken from The Church of Jesus Christ of Latterday Saints hymn book, hymn number 301. The text was by Naomi W. Randal, b-1908, ©1957 LDS. Music was by Mildred T. Pettit, 1895-1977 ©1957 LDS.